Stage one of the proposal involves continuing a loop track from the the Williams House path running along side the FNHL carpark and joining together with the existing path running along side School Rd. The existing retaining wall will be non-structurally modified into a usable seating area for people to rest or have lunch. It will also involve a tidy up of the steam area on the Williams Reserve moving debris and any rubbish. In time we hope to have a community run Tui feeding station set-up in the area. Volunteers interested in helping with the building of the seat and path, should contact Craig, craigsalmon@gmail.com When dates are finalised a call for help will also be put out via FP email and FP Facebook. 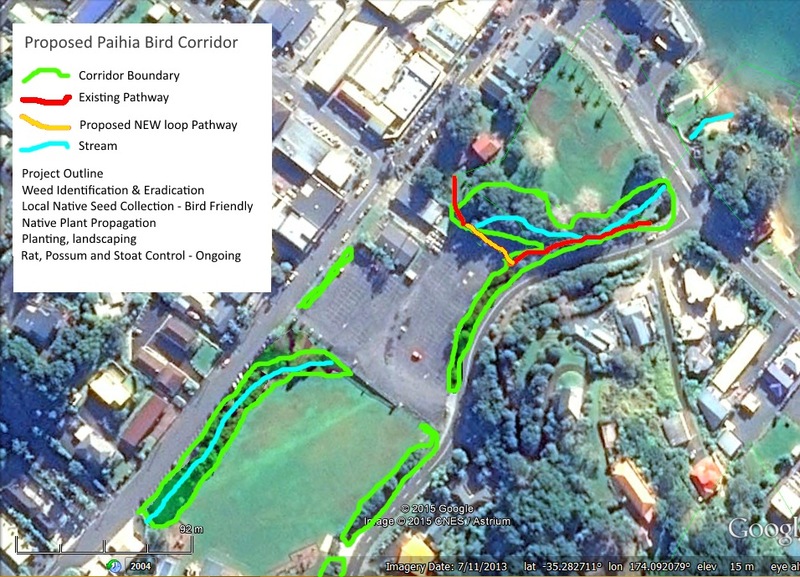 Stage two involves the planting of bird friendly native trees on council land between the FNHL carpark and the 4Square, with the removal of the non-native melia azedarach trees – and a continuation of the path to the north entrance to the FNHL carpark. Planting natives on the School Road side of the FNHL Carpark. This involves discussions with FNDC. Clear weeds and non natives from the land area between Paihia School and Williams Road and planting bird friendly native trees. This involves a number of parties including FNDC, FNHL, Paihia School, the Community Board, The Shade House and Forest & Bird.